Do you have tingling or numbness in your hand that goes beyond your first three fingers? Do you have weakness in your forearm, arm or shoulder despite your weight training routine? It’s not carpal tunnel since it involves more than the fist three fingers. And you have no history of neck problems, all orthopedic tests and X-rays/MRI of the neck are negative. You might have an entrapment syndrome of the brachial plexus nerves or subclavian artery/vein to the before mentioned structures. This entrapment syndrome called Thoracic Outlet Syndrome is caused by three major conditions; Anterior Scalene Syndrome, Costoclavicular Syndrome and Pectoralis Minor Syndrome as well as some minor causes. In the first condition called Anterior Scalene Syndrome, the brachial plexus nerves arising from C5, C6, C7, C8 & T1 nerve roots is trapped between the anterior and middle scalene muscles which may be in spasm or compensating for inhibited neck muscles. This can be assessed by palpating for a decrease in strength of the radial pulse at the wrist. The patient is asked to ipsilaterally rotate, contralaterally laterally flex, and extend his neck at the spinal joints, while the radial pulse is palpated; this called Adson’s Test. Decrease in strength of the radial pulse is positive for the syndrome. Treatment consists of using spindle work on the bellies of the scalene muscles or golgi tendons of the scalene attachments and of balancing the other neck muscles which can be either inhibited or compensating. 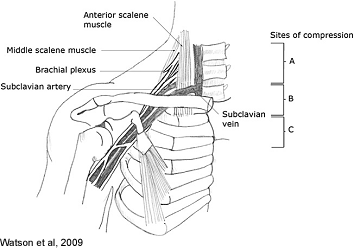 In the second condition Costoclavicular Syndrome, the brachial plexus and subclavian artery and vein run between the first rib and clavicle in the medial pectoral region. If the posture of the relationship of the clavicle and first rib changes and they approximate each other as often happens with rounded and slumped shoulders and impingement may occur. This can be assessed by palpating for a decrease in strength of the radial pulse at the wrist when the patient is asked to stick his chest out and pull the shoulder girdle back and down similar to the military posture of attention. Again, weakening of the strength of the radial pulse would be considered to be a positive sign. This is called Eden’s test. Treatment consists of checking muscles such as the SCM and the subclavius that attach to the area, improving the patient’s posture and checking muscles that resist this bad postural pattern such as the rhomboids and the middle trapezius. Treatment consists of checking for either an inhibited or facilitated pectoralis minor, or other muscles that can be inhibiting or compensating such as the serratus anterior, latissimus dorsi or the lower trapezius. 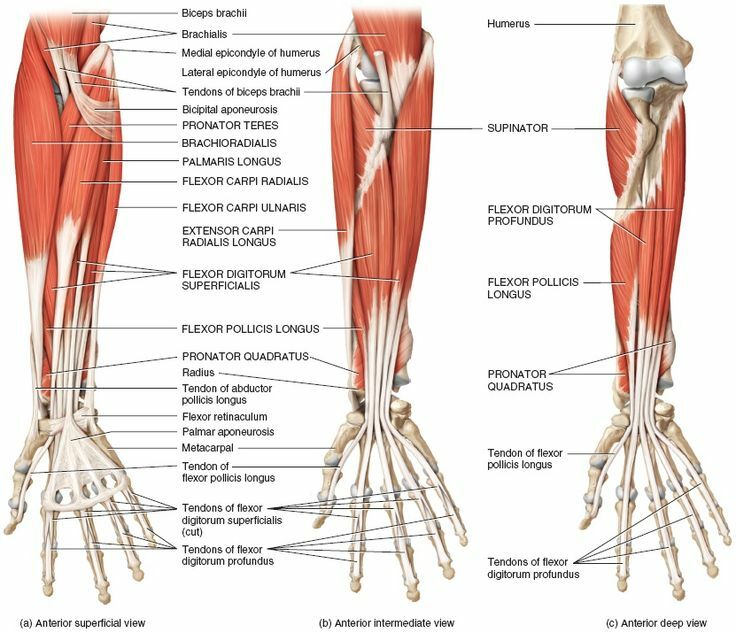 Other minor conditions such as when both the medial and ulnar nerve getting entrapped by a spastic muscle such as the pronator or by a misalignment of the radius and ulna bone can happen and need to be ruled out. Two weeks ago, I attended a mini-seminar from Metagenics on the use of Specialized Pro-resolving Mediators (SPMs) for the resolution of inflammation. As you may know, inflammation is an immune response to insults such as injuries (cuts, wounds, vertebral and extremity misalignments, muscle spasms, infections (bacterial, viral or fungal) or unhealthy dietary patterns. Although acute inflammation is a normal protective response, it can give rise to chronic inflammation if left unresolved. An important key to controlling/resolving inflammation and subsequently preventing chronic inflammatory conditions lies in SPMs and their pro-resolving properties. SPMs are produced from long-chain polyunsaturated fatty acids – especially EPA and DHA – illustrating the importance of appropriate nutrition in the body’s resolution of inflammation. Although EPA and DHA are metabolic precursors of SPMs, SPMs are directly responsible for resolution activities whereas EPA/DHA are involved in other beneficial biological activities. This means that a smaller amount of SPMs can resolve inflammation better than a “ton” of EPA/DHA. Please see the following video: Fish Oils vs SPMs: What’s the Difference? Anti-inflammatory drugs (NSAID’s) have been the go-to therapy for many acute and chronic inflammatory conditions. However, anti-inflammation is not the same as pro-resolution. To put it another way, NSAID’s shut off the fire alarm signaling inflammation while SPMs put out the fire. In fact, NSAID’s may delay resolution activities and undermine the body’s attempt return to homeostasis and tissue healing. Unresolved inflammation and unhealed tissue can lead to fibrosis that can impair organ and muscle function.